Thank you very much Geiri! I'm pretty sure I have to start hoarding 2N5457s.... they're getting way too expensive. You're welcome! I couldn't have done it so nicely without Marks help. You should get as much of them as you can. I've got hundreds of J201 which are my most used JFETs but I'm definitely gonna stock up on 2N5457 as well! Sorry for bad English, I'm from Indonesia! Maybe I'm blind, but I can't seem to find D1 on the diagram. Is it missing? Ah yes that's true! Will fix it! I am way excited for this! Thanks! Go Geiri! Can we expect some more? Haha maybe! I like doing this but I think I'll just start off smaller and work my way up. Mark gave me a bunch of tips that are very useful. Let's see if I can find something that isn't here but still within my ability. Great looking job, Geiri! I'd love to see more layouts from you posted here! I just got DIYLC a couple weeks ago and have been having lots of fun doing layouts. I'm really starting to get the hang of it but then I see how Mark uses links and whatnot and realize I still have a lot to learn! Hey looks and sounds good - is there a schematic available for this anywhere? I think I'm going to try fitting this into a 1590A. Just a note about this circuit.... This was meant to be installed in a bass, thus the 500k pot on the input simulates the bass volume knob. If you're building this into a stompbox, I would probably put the level control on the other end, where it's buffered. Just my two cents. can i use a 9.1v zener instead? I think so. I actually question if those zeners are necessary in a pedal. They look like they're doing some kind of static protection, which would make a lot of sense mounted in a guitar, but on a stompbox, I'm not too sure. It would be easy to create a the control of middles??? Replace the 750 ohm resistor with a pot. The Fender Twin Reverb has a 10K in that slot, so that might work. where is the input, ouput, switch etc wired? anyone know how to mod it out to be more like the one in the video with DI? is this still not verified? Thanks Robin, I'll get Geiri to correct the bass lugs. Hi is the current layout the right one for the bass lugs? What did you mean by the reversed lugs? I get this annoying noise like a wind blowing, only with the bass pot. When it's zero, there's no noise, but as I turn up there's the noise. All my joints are healthy and good. Hi, is there a schematic somewhere? Could someone confirm the connections and components for Pot Middles? 10K would be way too high for the mid control. The circuit is low impedance...bass and treble are 25k instead of 250k in a Fender, so the mid should be a 1k pot, or at most a 2k. 10k would quickly decouple the tone controls and you'd end up with a loud, midrange mess, and no control over bass and treble. Thank you, I forgot about the divide by ten impedance trick! In my tests about 5k is the most you would ever want to go. Any higher than that and the whole ciruit gets really loud. Congratulations! is very good, just try it, and this really well, I have only one problem with the bass control, and I see a 1uf cap is in truth electrolytic 1uf and is not? Sorry for my English! I write from Argentina! Built this one for a friend's birthday and found some mistakes: Vol 2 sould be vol 3 and treble 1 should be treble 3. How would one install this onboard a bass guitar instead? Hi Simon, i have just bulid this preamp today and getting the same bass pot problem as you mentioned above, do you know how to fix it? Thanks for your help.! Hey Unknown, I just redid the board and it worked again. I changed all the pots and checked all solder joints but it didn't work first time. Second time it worked! Nipponbass - if I'm not wrong, take the top end of the 750ohm resistor and solder it to lug 3, and the bottom end to lug 2. Lug 1 will be ground. If the sweep is reversed just swap lug 1 and 3 around. This was too long ago I can't remember sorry! How can I increase the high cut when I roll down the control pot? How do you wire the XLR out to this schematic? Great stuff!!! and here's a vero that's one column narrower (17x12) and it's more like the pedal version since it has the 330K pull down (anti-pop) resistor on the the input. Can you reccommend this circuit for a passive bass as a pedal? IMO, it works even better with passive basses and I believe that's what it was originally intended for. and the tone pot of my bass i got a unwanted noise, I already checked the wiring connection and the components and it seems to be correct. i have the same exact problem, did you found a solution? John Kallas, thank you for your layout, it works ok, but I have not tested too loud yet. - "treable 3 & bass 1" should be marked as "treable 1 & bass 1"
- "treable 1" should be "treable3"
but i already did that thanks to John Kallas for his correction. I am confused of my capacitor if this would be wrong. can i see your actual PCB? I had at home only cheap capacitors, maybe I replace them for some time. It looks like the only defetence is the 470nf capacitor ,, I'll try to replace a ceramic instead using maylar if this can solve my problem ..
Elmer, where did you put a potentiometer? at the Input or output? I have at the output, when I had at the input then was a lot of noise and drive. I still got little drive, but I've tested only on guitar tube amp, on headphone amp is ok.
my only problem is the treble pot it has hum when it reach to average to maximun resistance of potentiometer . I had a bad fellings of my bass tone pot too. I have the same thing with my when I connect to the guitar amplifier, on headphone amplifier (mxr clone) is great. I have not tested on the bass amplifier. It is a preamp, maybe I try to connect to some audio amp. And when I be ordering parts, I replace caps on better. Well , good luck to both of us ill do my best . you will want the volume pot at the begining of the circuit. Hot bass pickups can clip this circuit quite easily. Also battery life will be better since you are would only amplify what you need rather than amplifying the whole signal only to cut it down at the end. I've followed John's second layout (17x12) and it works like a charm. I've tested it in a little PA system (stagepas 400i) and the sound is very good. However, thanks John, mark, and all of you who post, almost daily, this little gifts...! Is there any unwanted noise ? no unwanted noise at all. I just built this to spec above, and I'm having a few issues. First, when I don't use a high end power supply, such as a Voodoo Labs Pedal Power 2 Plus, I get an insane amount of what sounds like space reverb echo octave up. It's absolutely insane. The more I turn the treble and volume knobs, the more it acts up. Bass knob does nothing. When plugged in to a good power supply (voodoo labs PP 2+), the sounds are gone, but the treble control doesn't work until around 2 o'clock, and when it kicks in, it sounds like it is going to blow the speakers right out of my cabinet. The bass knob doesn't seem to do much at all, nor does the volume for that matter. I've done a bunch of builds off here with no problem, so I'm coming to here to see if anyone has any idea. there must be an error in your build somewhere. mine works great with either my bench top lab power supply or a cheap wall wart with none of the issues that you're describing. So, I just opened the pedal back up. I touched up a few solders that may have been cold and messed with the veto a little in case something was touching and now it seems to work. The issue now, is that the treble pot is backwards. Meaning when the pot is turned all the way, it is no treble, and then as i back off, more and more treble comes in. Completely backwards. The schematic has board to Treble 3 to Bass 1, does this need to be reversed or something? btw sory for my bad english, because i am from indonesia. I mentioned that the treble pot was backwards earlier but they never corrected the posted layout. there is NO hi cut on the Sadowsky. both the bass and treble controls are boost only. flat is with them set at their minimum (fully CCW). if you want less highs you have to roll the tone knob on your bass down. Ah..ok! thanks john, I have it on board mounted, it sounds very nice but the high are ok near the full CCW and I like to have also a darker sound. I really want this as a D.I. What do I need to do to make this an XLR out. Thanks! Does anyone have an actual schematic of this pre? Id love to etch my own board for this to put inside my bass. THANKS! Hi, I just build this preamp and it sounds interesting. But I think the output volume is too low. I need to adjust full volume on my speaker just to get a fair volume. What's the matter? Should I use buffer in the input of the preamp? mine has plenty of output. first check your voltages at the drains of the Jfets. they should be at around 4.5V. if they're not, you'll probably have low volume issues. I followed your layout and it sounded fantastic. Thank you. One more thing, how to add a mid control? I mean how to connect the mid pot's lugs into the circuit board? Thank you. since the bass and treble controls are BOOST ONLY on this preamp, it's not just a matter of adding a pot. you'd have to add an additional amplifier circuit to have a boost for a mid control. with the bass and treble controls fully counterclockwise, this preamp is flat. increasing them makes it scooped in the midrange and just adding a mid pot would only make it even more scooped which, IMO, would not be beneficial at all. It's normal that they have similar voltage for both of them because they have the same source of biasing voltage. Or maybe I did wrong on the biasing? Another one, I changed the zener diode to zener 9V size. I thought it's fine because the supply is just 9V. But anyway, is it the problem? I made it from the vero and built one. Sounds great. A few optional mods there too. Great sounding little preamp. But you can switch the bass pot to a 10 k pot without problems. The circuit doesn't do anything beneath 7 or 8k (therefor a 25k lin pot is unusable. Reacts only up to 9 o'clock). I'm going to build this circuit but I want to use it as a pedal. If so, where should I benefit more from the volume, input or output, how does the original go? I will be running my bass passive. Also, the 5uf(4.7) output cap, does it really have to be electrolytic, or is it 4.7 uf metal film way to big for this build? Well it's a lot easier to find a 4.7uf electro cap than a metal film, and I imagine they used an electro on the original so you may as well just take the easy route. Ei Charles, and regarding the volume pot, where is it on the original? Also, If it goes on the output, why a 100k pot, isn't 10 or 25k enough to keep impedance low? The posted layout is the pedal version! And as you can see volume is a 500k log pot at the input. I put the volume at the output on mine since it has less noise that way. with it at the input (like the schematic) it's running at full tilt and the circuit noise is quite noticeable when the input volume is low. Do you use a filtered power source? 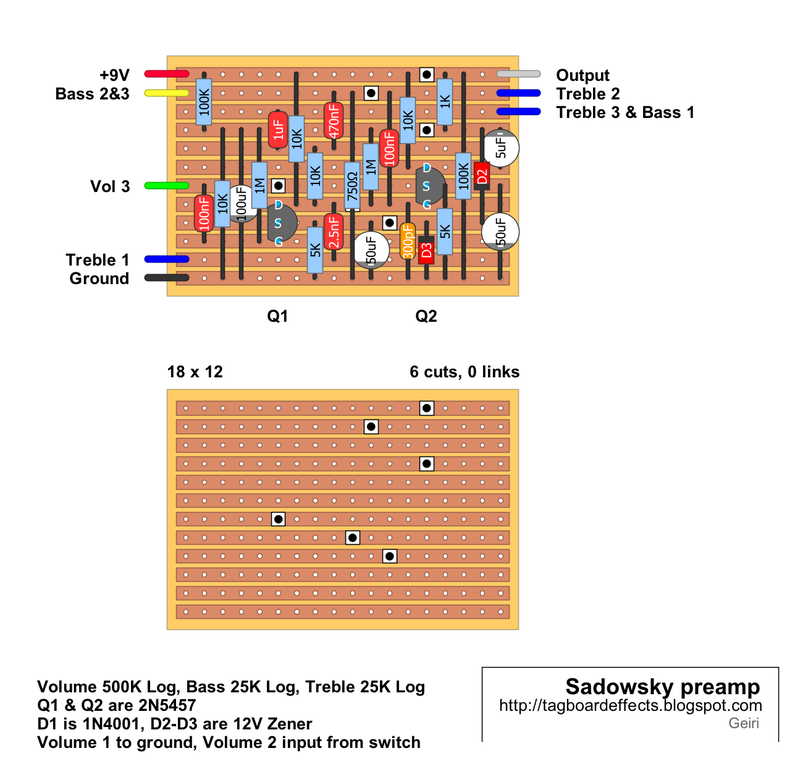 I read something written buy the guys behind Sadowsky that this pedal should use one of their power adaptors because it is well regulated and filtered. I know that fet based circuits are very sensitive to noise.They work like antennas. So, you used the volume on the end, what pot value did you use, 100k? I don't understand the use of 100k pot at the end since it's low impedance output, shouldn't there be something like10k or 25k pot instead? i connects the 10K and 750R resistors to ground. I have built John's version 0001, and I am having issues. I am new to all of this and need some clarification on a few things. On the left side of the layout it says Bass2&3 and on the right side it says Treb1,Bass1. Are the connections made in the same manner, and how are they connected. Hey Martin. The Bass 2&3 connection is easy to do - just take a wire to the Bass 3 lug, and then strip a bit a bit more wire so you can also make a connection to the lug just next to it, Bass 2. Basically it means that connection is joined between both lugs. They do not need to be separate wires. Same goes for the Treble 3 & Bass 1 connection - you could take one wire to the Treble 3 lug, then take a wire from the Treble 3 lug to Bass 1. Whatever is more convenient. They just need to be connected together. Thank you for the reply. I'll give it a shot tomorrow. Do you know what is the function of the 100k resistor on the output to ground?is it an anti-pop res, or is it part of the circuit? Output ImpedenceL 600K Ohms (XLR), 1K (Tuner Out), 10K (1/4" out)"
Therefore, this makes me believe that 1: There's a 330k pulldown resistor on the input; 2: The volume pot should be on the output and it should be a 10k pot leaving no place to that 100k pulldown( it would increase its output impedance) resistor on the output as showed on the layout. Nevermind, I've just found that the 500kvolume pot on input with the 1M input resistor forms an +- 330 input impedance and that there's a 10k resistor before the final 1k resistor on the output. Yesterday i built JK's pedal version. However, i found it start distorting a little in the low end when turning up the bass pot. I suppose the distortion comes from the preamp and not my amp, since it distorts quite the same at different output volume levels of the preamp... but im not really sure. Anyone else has the same 'effect'? I've tested mine today as well. I've used the volume pot on the input and this beast distors like hell specially when the bass pot starts going up. Segfredo, where did you put your volume pot? I had the same issues. Distortion and no headroom. The whole thing comes from Q1. Change that one to J201 and the problem will be gone. At least for me this did the trick. Also it is adviced to do power filtering. It can reduce the hiss. I moved my pot to the output as well. Since I don't have a 100k pot UI have a put the 500k that was used at the input. I'll be waiting for a 100k log pot to arrive. By the way, did you check the video that Simon Tan has put on youtube? His clone sounds good, it sounds as it should , no boost in volume or distortion of any kind. I'm trying to get in touch with him to see if he can help. I also have almost no headroom for the volume pot. I've built this one for my passive jazz bass. I use the two volume knobs mostly for tone nuances instead of volume. Its safe to say i mostly play with full output on my bass (both pickups 100% and sometimes the bridge pickup rolled back a bit). Therefore, would it be a good option to add an input (trim)pot to tune the preamp for my bass? And if so, should i loose the 330K resitor? I've put a 100K trimmer where the volume pot is on Geiri's on-board version. So basically i have two volume pots. Then i dimed all pots and gradually turned back the trimpot till i had no more audible clipping. At this point i still had a lot more output volume then my direct signal. I left the 330K resistor, but i guess that basically just changes the sweep of the trimpot a bit. 1:The onboard version is 1M input impedance and 1k output impedance. 2: The pedal version is 330k input impedance and 10k output impedance. So, what has changed between the two? It seems more obvious now than it did before. The volume pot should be 10k ( 10x higher than the 1k output resistor) and since it uses truebypass switching it should have something like a 470/500k resistor from input to ground that together with the first 1M resistor forms a 330k input impedance. Bearing this in mind: I've just wired a 10k Log Pot on the output, and since pedal is always on with no switching I've left the pulldown resistor out. Try it and see if it doesn't sound as it should!? I believe the volume on the input works great, specially if you will be using basses with different output levels. Anjang, Check for solder joints. Seg, If it works for your needs, great. This is a simples jfet preamp circuit and it works as any other of the same kind. The input inpedance is high enough so you can take basically anything you throw at it. The volume and "overloading" it's the nature of the beast. Just go to the Sadowsky site and do some investigation and you'll soon find that things are way simpler. It sounds fantastic, it doesn't distort and it is ultra-quiet! I think the 100k res on the ouput should stay there. I think it is part of the circuit. Can this be voiced to suit an acoustic guitar? Hi, can I use this pedal and then my marshall speaker guitar simulator straight to the mixer to play my bass live? Just built this, sounds fine though a little noisy. Even when set flat its much much louder than my passive bass usually is, so I'm thinking of adding a trim pot; but just to complicate things I'm going to change my pickups to EMGs soon so I'm thinking I may need a trim pot on the input and output to keep the level sensible and prevent clipping. Any suggestions what values of trim pots I should use? Wondering if anyone can assist me with adding the DI/Balanced output? hi, when I switch the power on. There is signal but immediately the signal attenuates an becomes barely audible. can anyone suggest what might be the problem? Thanks. Is there a chance to make this on-board? will this work well with a 12v ps? This layout was based on which schematic diagram? I once had these problems. The 2N5457 transistors were manufactured by Motorola, but since they are manufactured by fairchield only give problems. I am using smd or MMBFJ201. You can use J201 Noise has stopped. Have built this. Works and sounds good, but VERY gainy (used with bass humbuckers). With 2n5457 overdrives easily :(, j201 gives a bit more headroom. Any tips how to decrease the gain of this circuit? Mamy thanks. 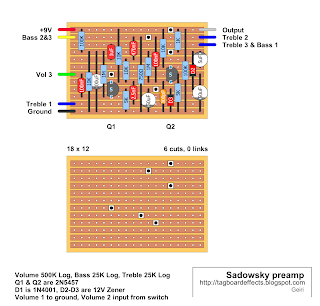 I preamps sadowsky on board, I place a trimpot of precision in the entrance, with the value of 500k. A 500K potentiometer can also be placed on the pedal, even with the volume potentiometer on the output! I'ts too noizy and messes a lot with the sound of your instrument. (not transparent) Johns version is a huge noize machine while Geiri's is a bit better. I've mingled more with John's to remove the noize withought any luck. Ive added a trimmer at the input (started pickup radio signal...) I've tried to bias the fets with higher resistors and that didnt work as well. Anyone actually built this and works okay? If yes how and which? I am finally on a right track. I switched to MMBFJ201 smd jfets and its alot better!!! -(on my telecaster it plays beautifully all the strings except the last E which is also the lowest of all in range). -On a bass guitar as soon as you start playing it sharper it distorts alot. I was wondering. Is there a way to fix the distortions that happen on lower pitch notes? I also added the 500k precision trimmer on the input. Had the same problems with 5457 jfets. J201 sound much better but the preamp is loud as hell. Check drain voltage- I installed trimers in place of drain resistors to set proper drain voltage. Also, I think (may experts correct me) that experimenting/increasing resistance of source resistors will help to decrease gain. Anyone? Finally got it working excellent onboard. Hey nice!!! Could you provide us info on what exactly you did to make it work and sound okay? I've installed variable drain resistors to set correct bias and decreased both source resistors to 3k9. Also, experimenting with jfets might be worthwile. Mine 2n5457 didn't work properly, j201s seem much better. Now the volume with anticlockwised Treble and Bass is slightly louder than unity. You cant have xlr output like this. You need another board to convert to balanced output. There are a few cheap on the internet or you can build your own ofc. btw just had an original at hand and it has 500k for volume and 30k for bass and tremble. now i had to use 20k on mine otherwise there was way too much noise, something must be completely different in this layout.